Michelle Liew recently posted..Therapy dogs at work! Those are absolutely gorgeous! I love sunflowers…they are so bright and cheerful! Me too, Michelle. It’s hard not to smile when you see a sunflower! What beautiful photos! I love the flower. You always have such crisp and perfect pictures, Jennifer. Love it. Thanks so much for the compliment, Cathy! Thanks, Susan. I was excited to see them start blooming! Sad part is that it means we’re nearing the end of summer. LOVE the sunflowers! One of my favorite flowers! Great pics!! Thanks! I couldn’t resist taking a few shots as they started blooming. I love the bee on the sunflower! Great photo. Just another Mainer dropping by from SITS to wish you a good day. Hope you find time to return the visit! Is it possible to see a sunflower and NOT smile? Love this ‘montage’… I imagine a field of them. Such a nice way to start the day! A field would be great! Very pretty. Mine aren’t blooming yet. Mine just started! There is still one that’s not quite open yet. I’m sure you’ll see yours soon. thedoseofreality recently posted..Chapter 3: Going Home From The Hospital Is NOT A Rom Com + a Giveaway! They are so in bloom here right now in our garden, and tall as trees. It’s insane. My daughter says, “They’re looking at me!” So perhaps she wants them to face away from her! I’ll have to take some photos so you can see. Tamara recently posted..Some Things You Just Know. I would love to see some photos! I had to walk around the garden to take these photos. None of them are facing the same way and the best ones are facing a bush! 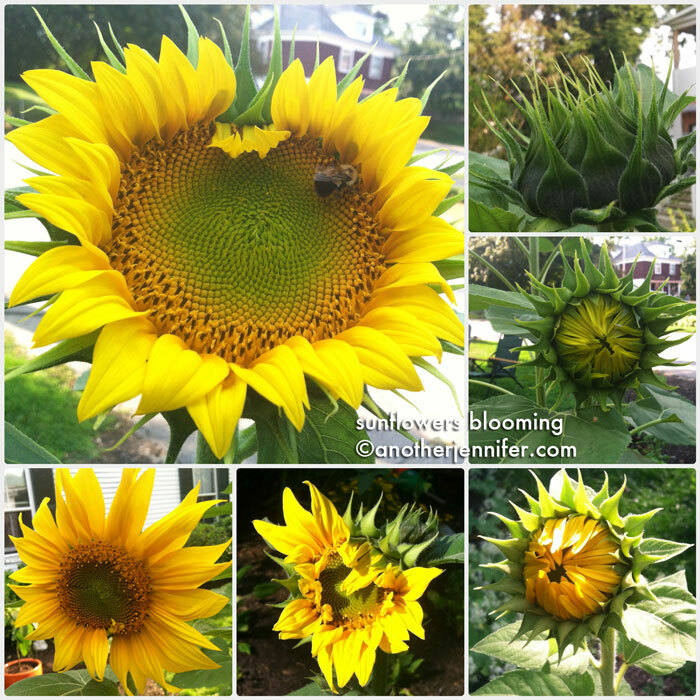 Your sunflower photos are really beautiful! We planted sunflowers in our front yard this year and have had the best time watching them grow. Thanks, Jean. Our birds ended up planting our sunflowers this year. Worked out well! Thanks, Chris. I know you would be a fan of the page. 🙂 Your encouragement makes me want to take more pictures! SO beautiful! I’m dying to share photos of my Jerusalem artichokes in flower – except they haven’t flowered yet! But they’re supposed to look like sunflowers…. They sound beautiful. I hope they bloom soon! Me too. They are just so big and beautiful! Krystal recently posted..Back With Guns Blazing! Ha! Your secret is safe with me, Krystal. So beautiful! I’ve always wanted to grow sunflowers but I kill every plant I walk by. Oh no! I’m like that with indoor plants, but I’m good with hardy outdoor plants.